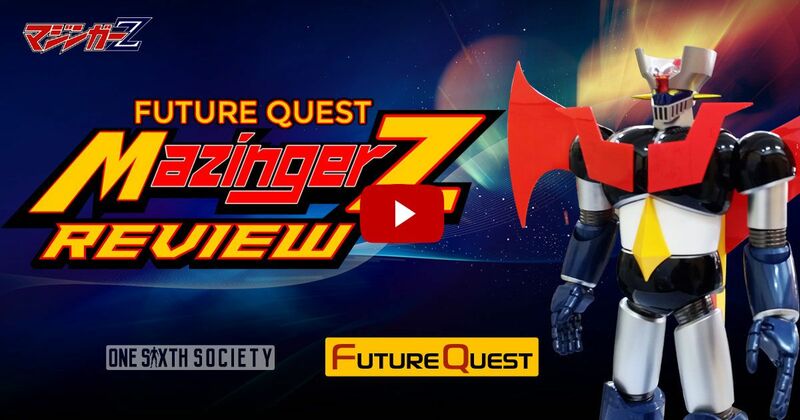 It is rare when a new company comes onto the action figure scene toting a variety of high-end licenses. 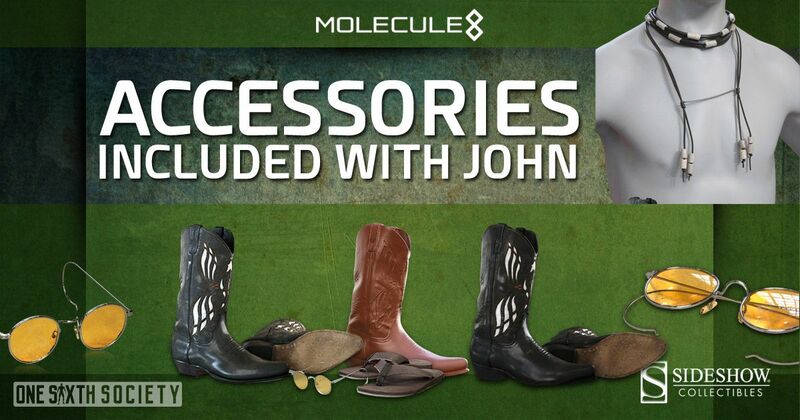 Its even more rare that a company comes out of the gate swinging with a product that is a home-run. Many collectors have been hesitant about the figures release, especially since we have not seen any final product photos. 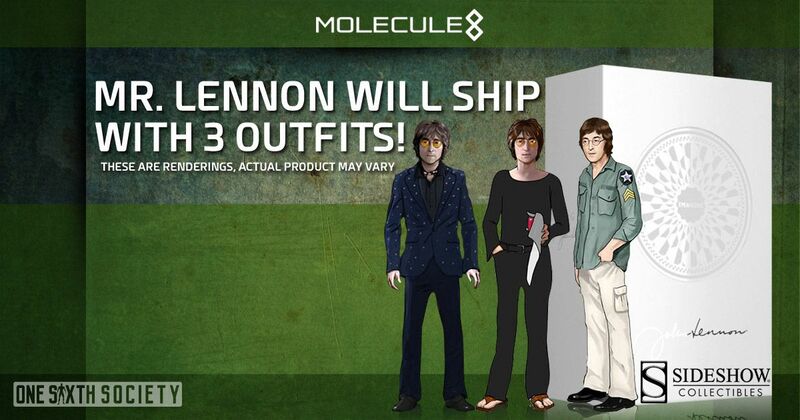 However, earlier this week Sideshow Collectables announced the preorder of the Molecule8 John Lennon Figure. 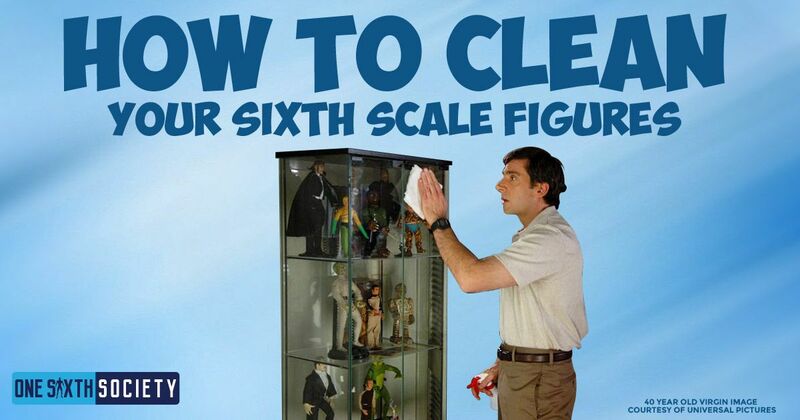 This should definitely give buyers more security now when ordering the figure. Many may be wondering what all of this means. 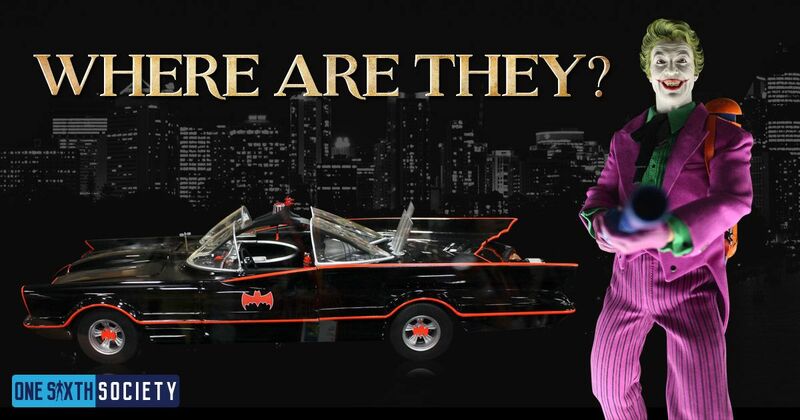 The most interesting thing to note is that this is an extreme show of confidence from Sideshow Collectibles. This speaks volumes of Sideshow’s thoughts on the production of the figure. 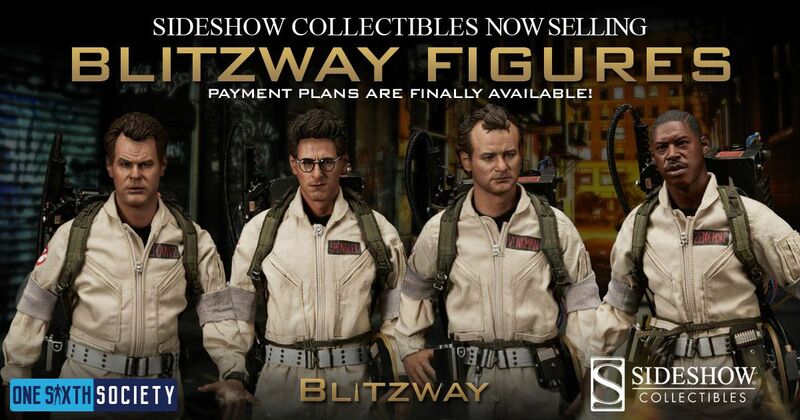 It’s likely to sway people who were on the fence about the figure as well considering Sideshow’s reputation. That said, there is some more news about the figure as well! 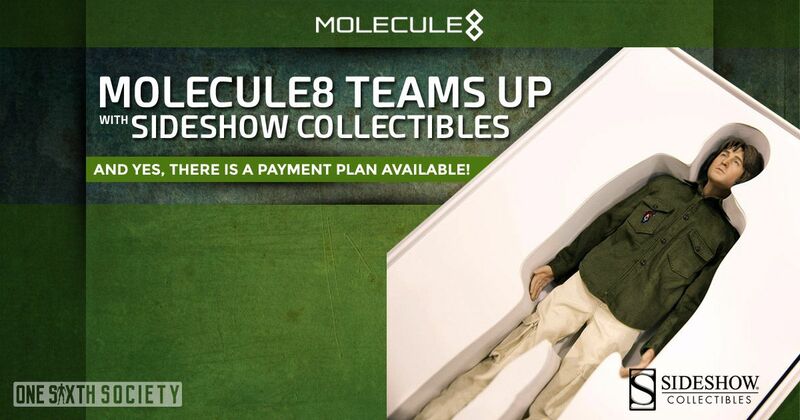 The announcement that Sideshow would be distributing the figure as a retailer, some new information and photos became available especially since our interview with Molecule8. The first thing that excites us is the announcement that there is two headsculpts included with the figure. The expressions include One neutral and one singing. Little is known if the figure will include multiple pairs of glasses or not. The listing just states Classic Yellow Tinted Glasses. Considering the figure carries at $299 price tag, the inclusion of two headsculpts should dampen the blow to one’s wallet a bit. In addition to two heads came the announcement that those who purchase the figure will be getting three classic outfits from the Imagine era. This ups the value of the figure tremendously, especially if all three outfits carry a high production value. Now, unfortunately we need to touch on some things that many have noted as less than perfect. All of the photos on the Sideshow page for the figure are either prototypes or renderings. However these items are going to be included with the figure. Now this is not inherently a bad thing, but it is a bit unorthodox to have a company take orders without final photos, or at least a more complete idea of the final product. Two of the three outfits shown are just sketches. The third military style outfit shown appears to be an inaccurate material and has an incorrect amount of buttons. It is just a prototype however. 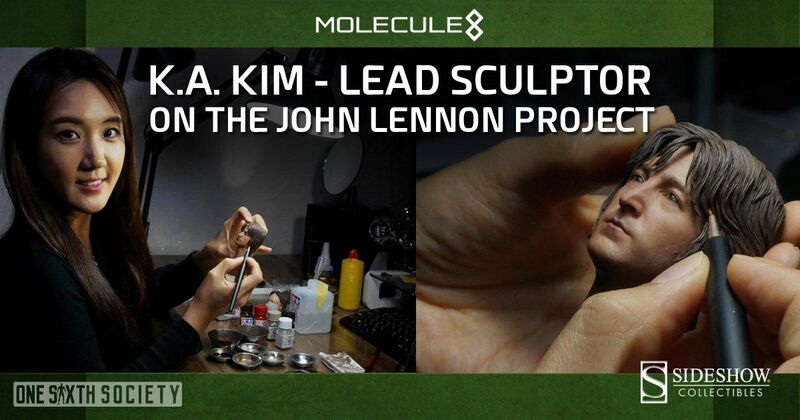 The one major thing that we should note is that K.A KIM is the lead sculptor on this project. K.A KIM is recognized as being one of the best sixth scale sculptors in the world. She was also the lead sculptor for the upcoming release of the Blitzway Ghostbusters figures. Previously she has worked with Hot Toys bringing to life many of the most popular figures sought after today. This act of faith by Sideshow Collectibles does carry some meaning. While it may just appear as a minimal action, the figure being carried by Sideshow basically dispels any kind of worry about the figure ultimately being released. That said, most of the things shown are prototypes, and $300 dollars is a lot to spend on a whim. 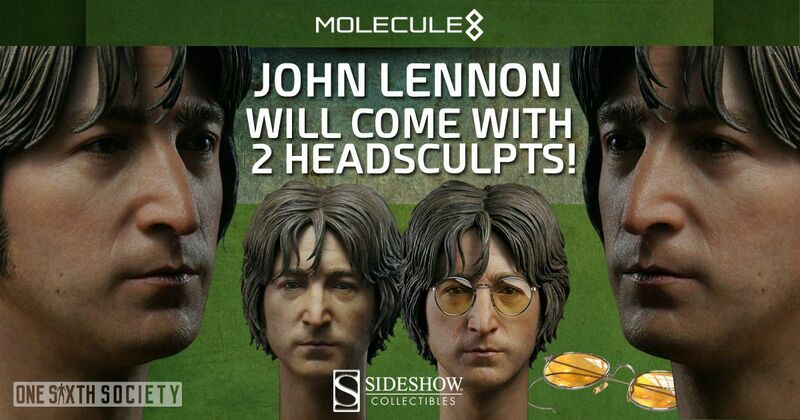 The Sideshow Molecule8 John Lennon Pre-Order was big news all around. The inclusion of an additional headsculpt and three total outfits is exciting. The obvious major benefits of ordering from Sideshow is that you will not be required to pay the full amount up-front. Not to mention you will also have access to a payment plan which is always helpful to your wallet. With a release now slated for June in Hong Kong and July-September in America, we will know what kind of quality Molecule8 carries sooner rather than later. PreviousNECA 1/4 TMNT Raphael Giveaway!